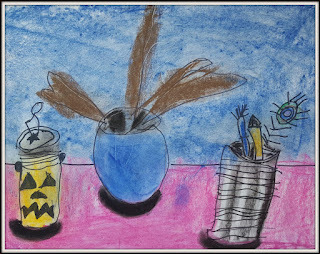 The objective of this lesson for my Observational Art Lab students was to show them that drawing objects didn't have to be intimidating, it was all a matter of breaking them down into a series of shapes and lines . 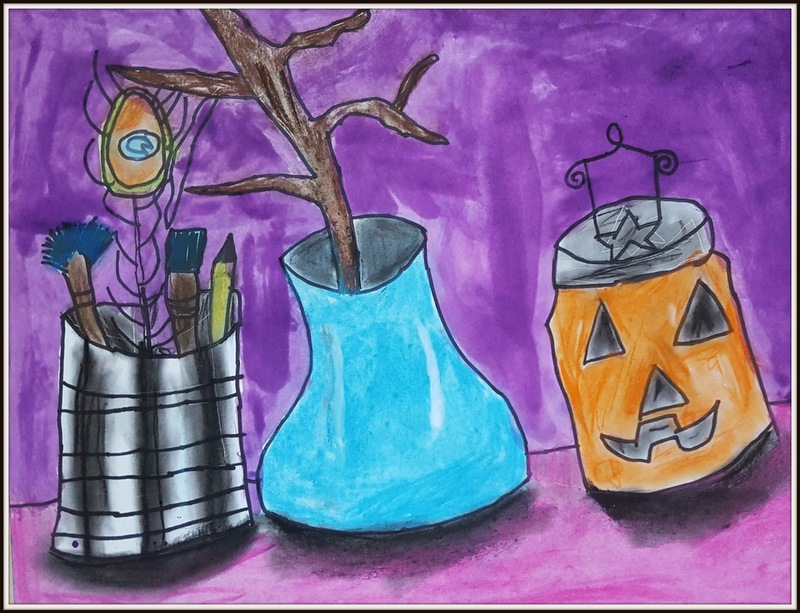 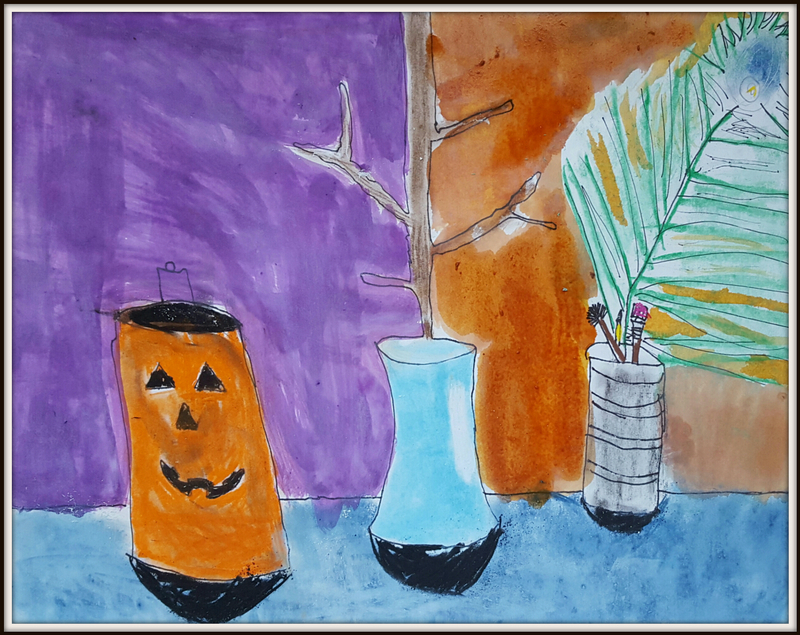 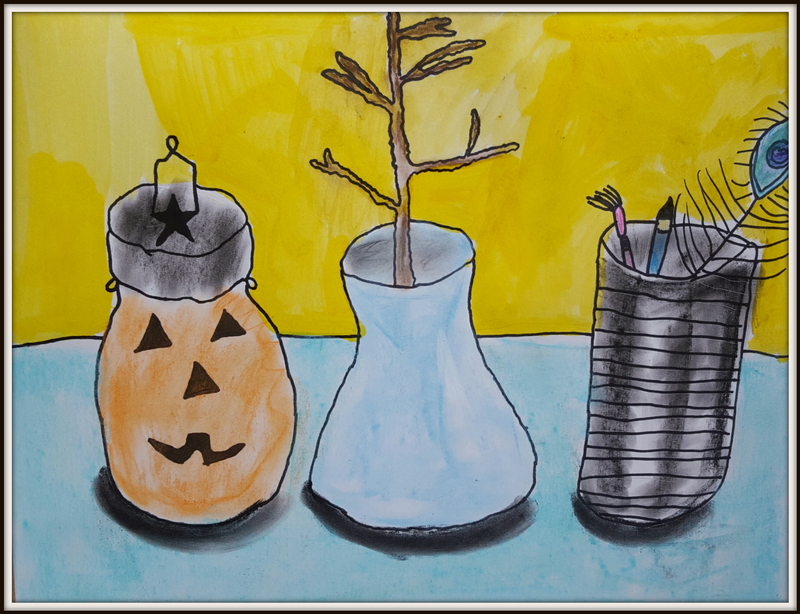 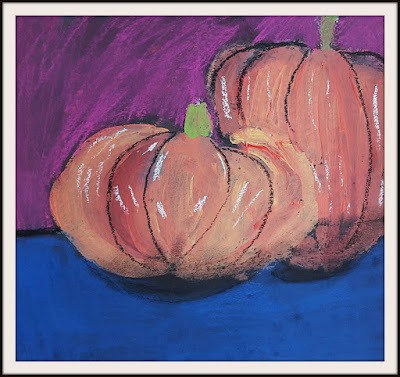 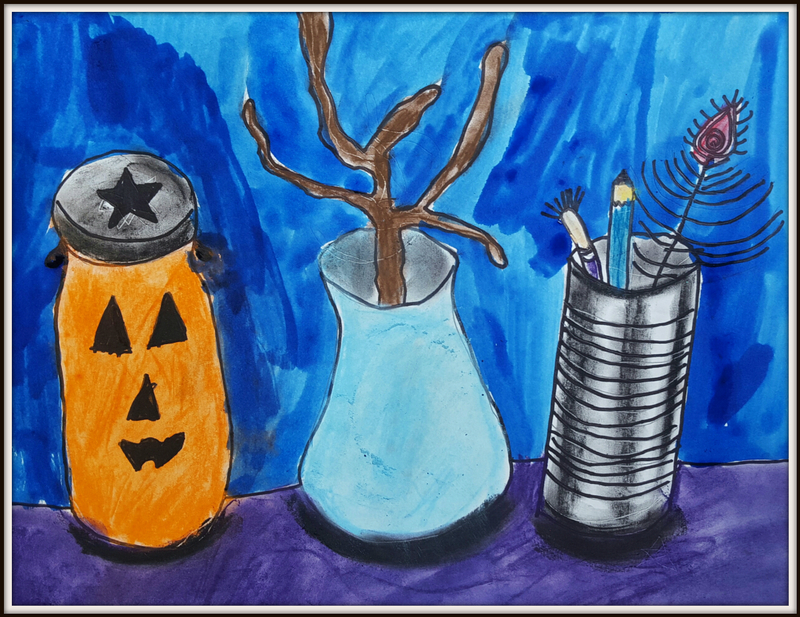 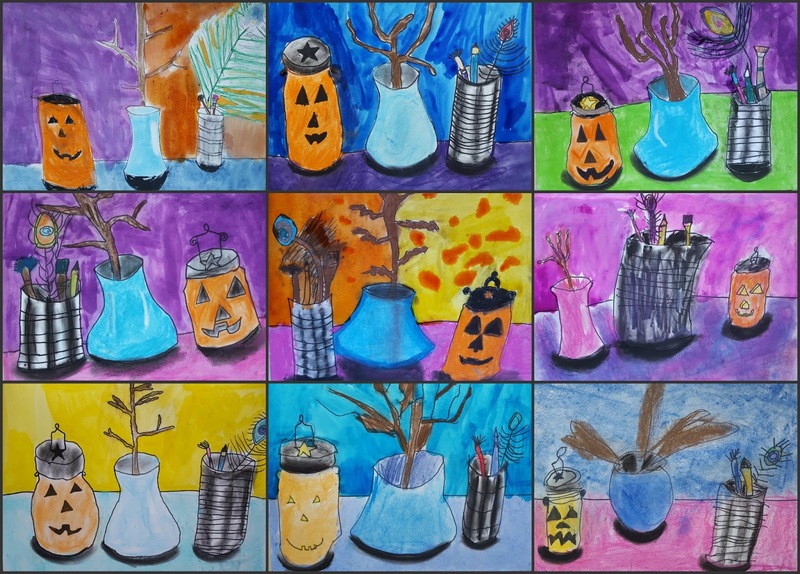 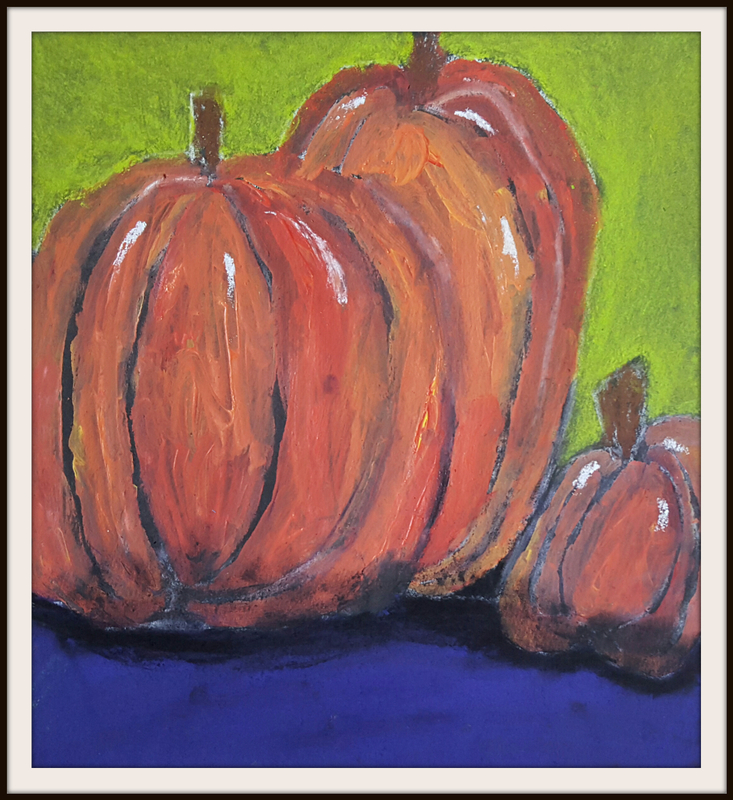 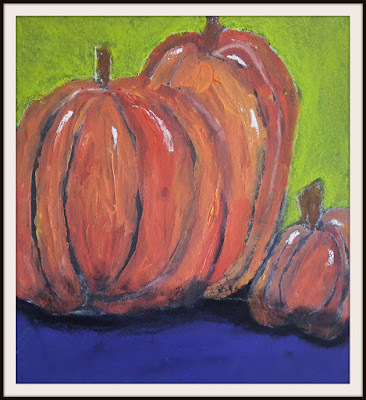 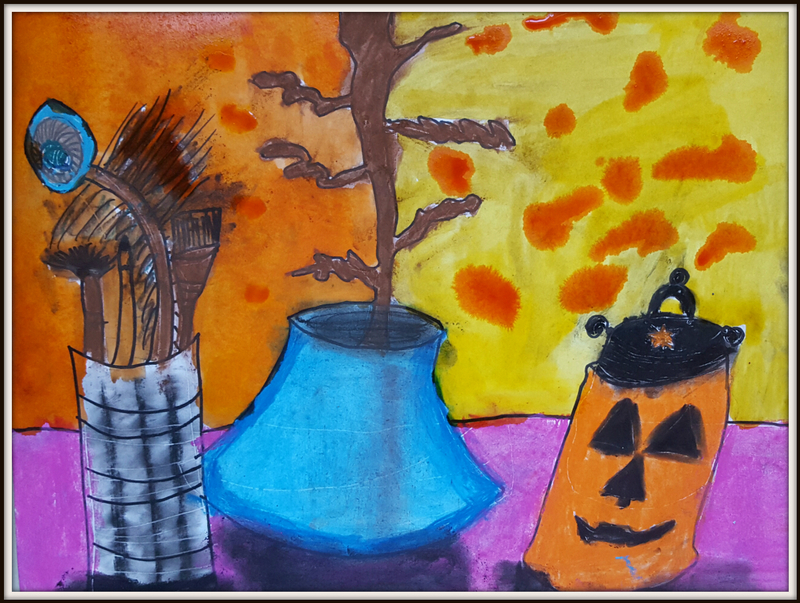 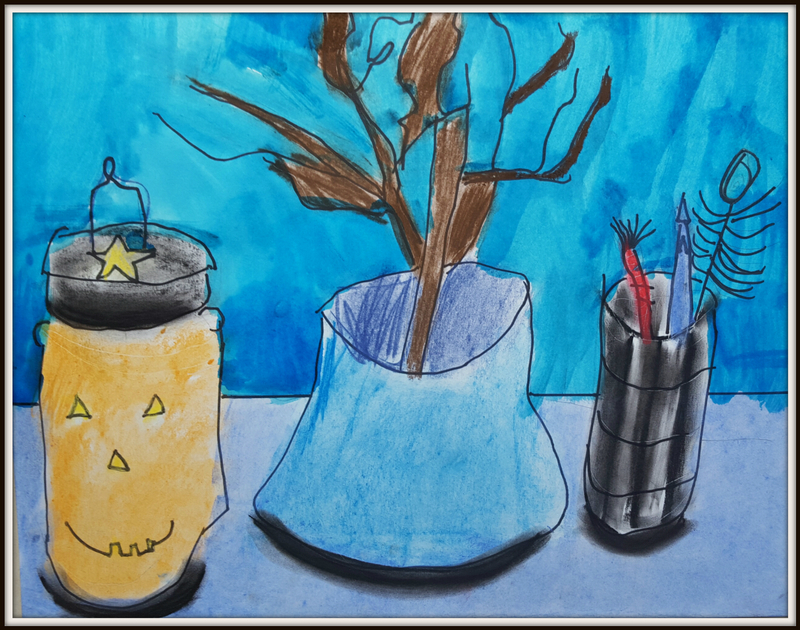 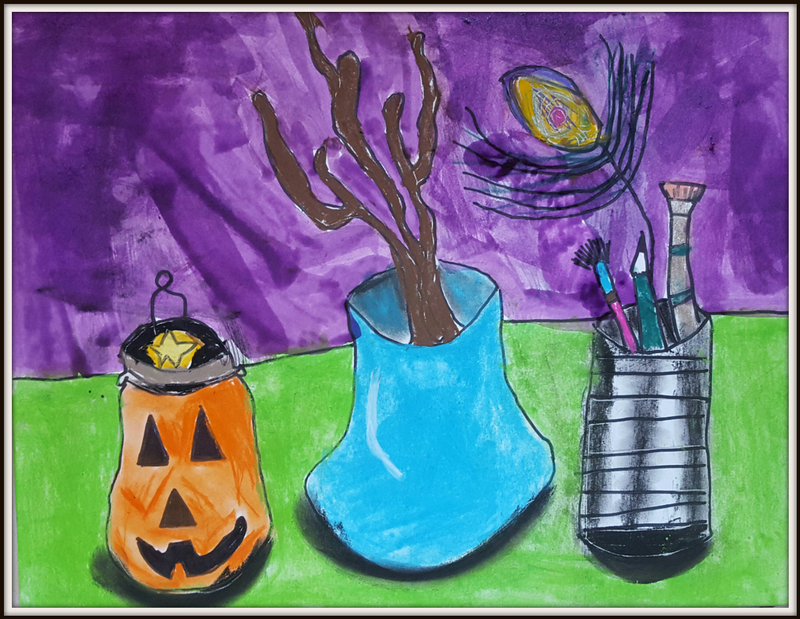 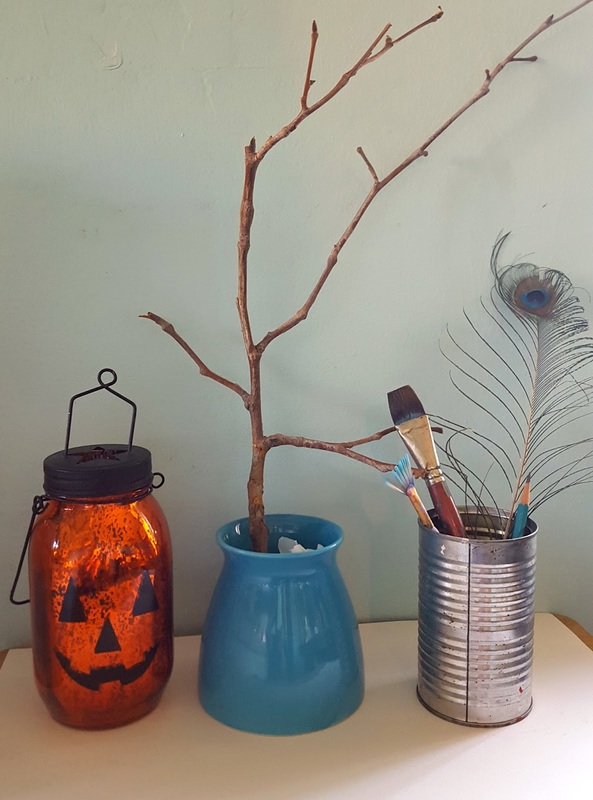 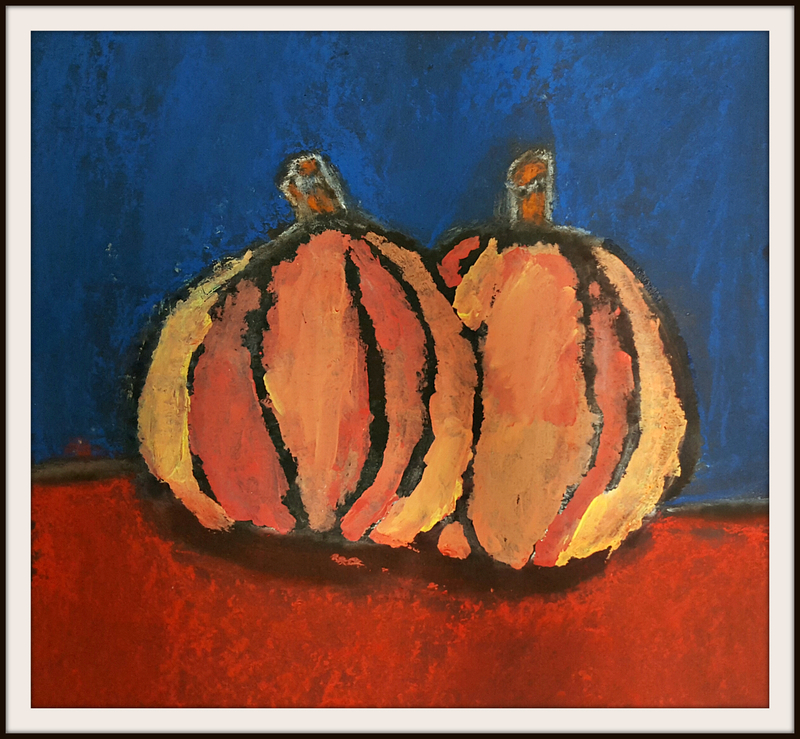 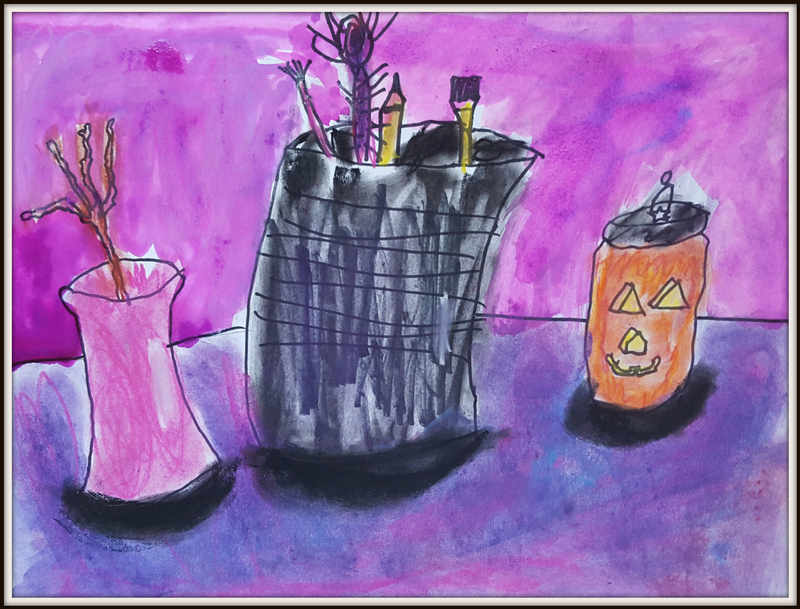 I was inspired by these wonderful tin can drawings done by 1st graders from The Art Room and these autumn themed still lifes in Arts and Activities Magazine.I chose these random objects and put them in the center of our tables. I pointed out that these containers shared the common element of ellipses. And I had them observe that the bottoms of these objects were curved rather than flat which would make a more 3 dimensional drawing. 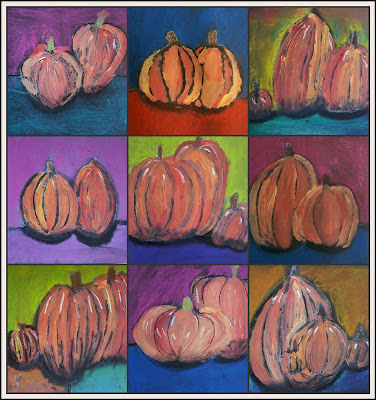 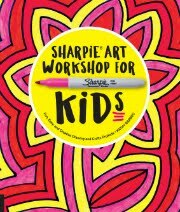 After each pencil drawing was gone over in Sharpie, the children used chalk pastels and charcoal to add color and shadow. 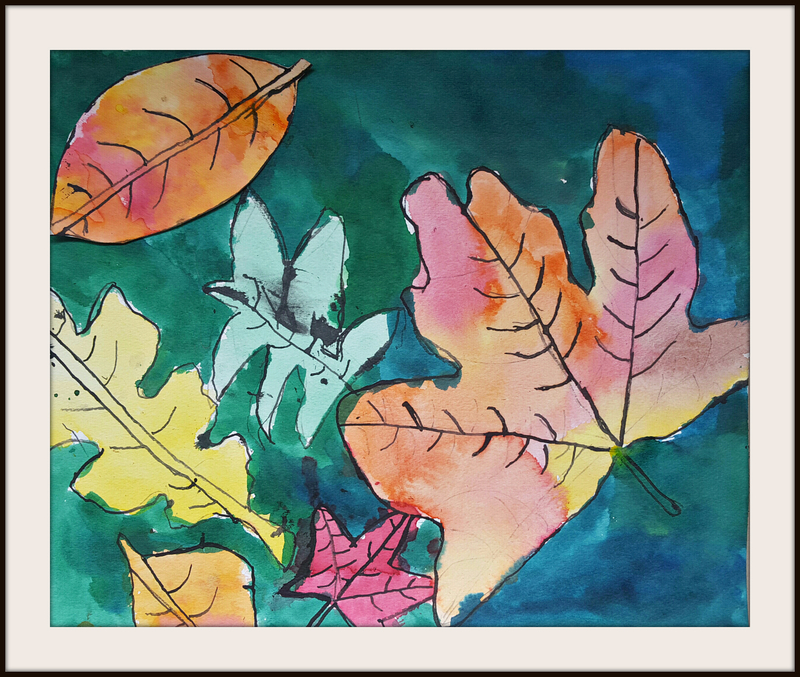 I gave them free reign with color choices for their table and watercolor backgrounds. 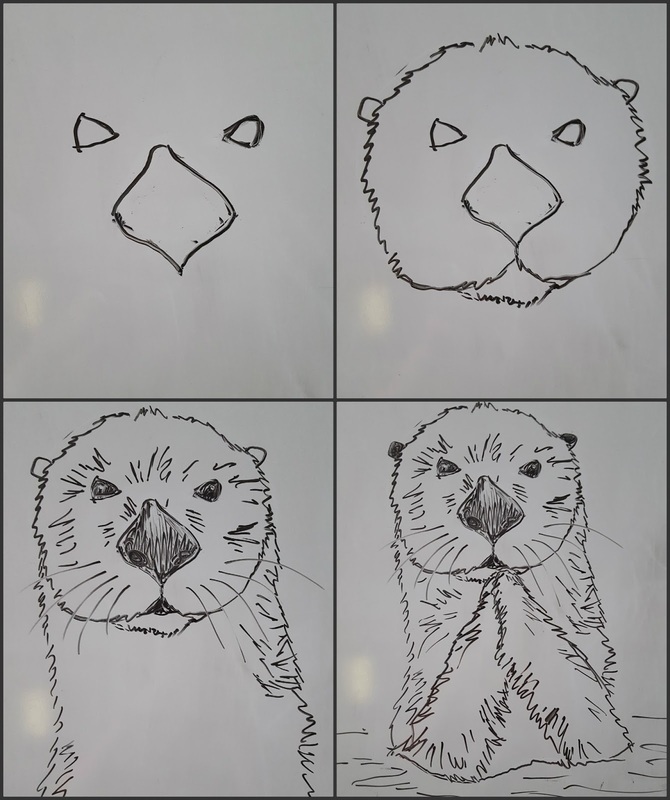 I was worried they might find this lesson "ho-hum" but these kids are great about diving into any lesson with enthusiasm. 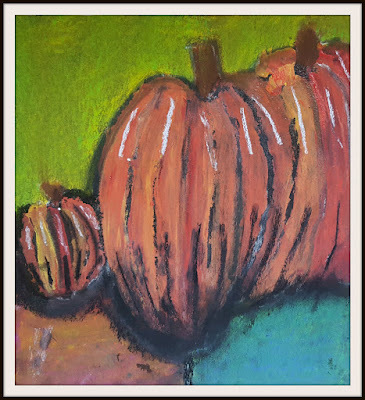 My Observational Art Lab students created these works on roofing felt ( because I'm obsessed with this material as a canvas and love the drama of color on black). 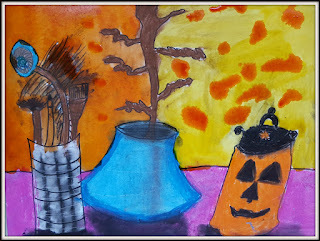 I had some pumpkins in the center of our tables for the kids to observe. 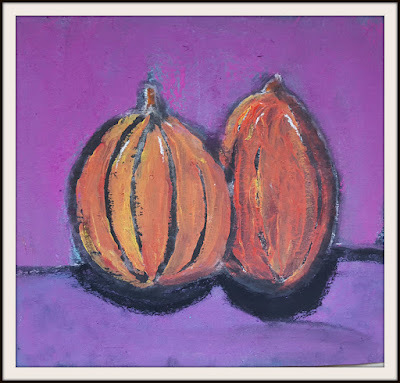 We broke down the pumpkins into a series of simple curved shapes using white chalk. 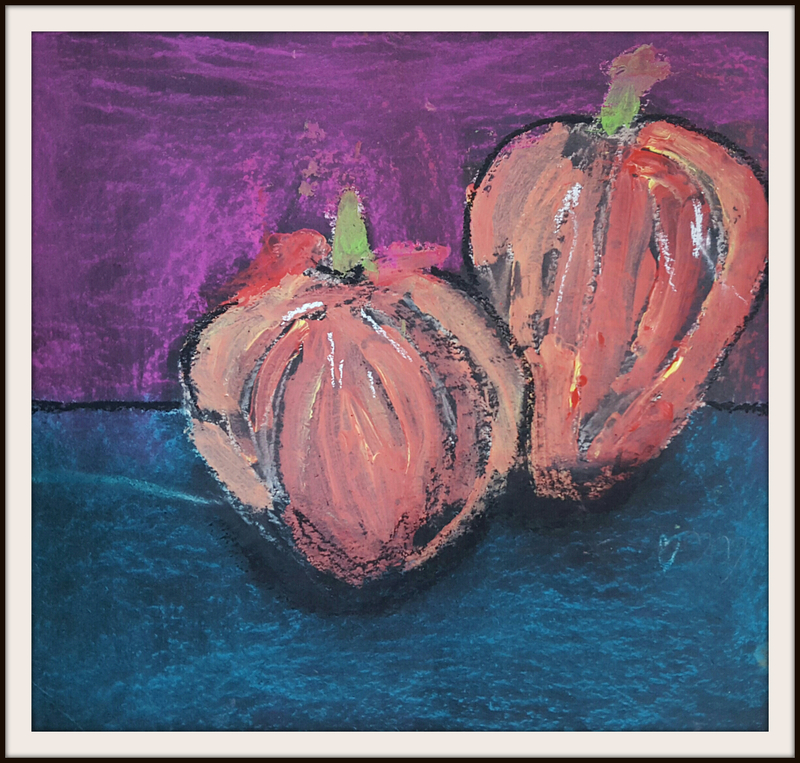 I showed them how to add additional pumpkins in the background to create a sense of depth. My two guidelines for this project were to 1) double dip their brush into yellow and red paint, rather than premixing (no water) and 2) try not to paint over their white chalk lines. 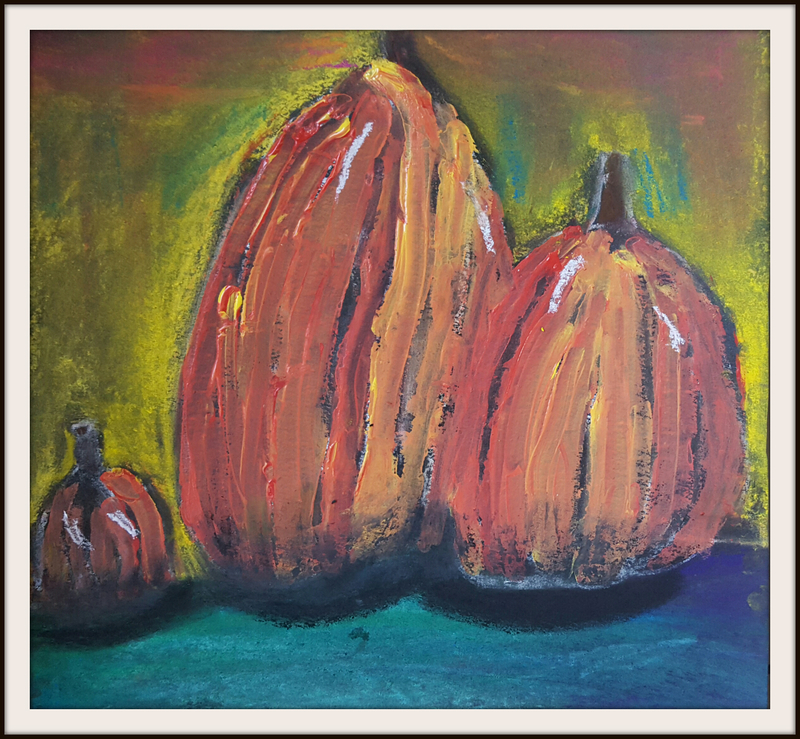 Once the paint was dry, we took damp paper towels and wiped the chalk away, leaving dramatic back lines. 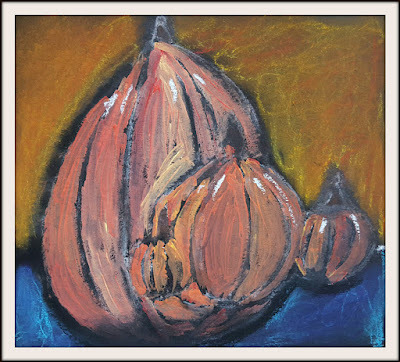 Backgrounds were done in chalk pastel, also blended with the help of a paper towel covered finger. 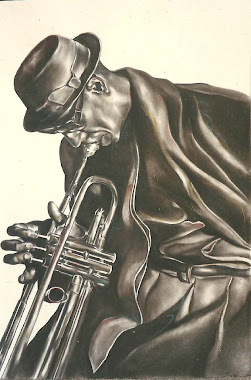 They added last touches of charcoal shadows and white highlights. Love the painterly effects in these! 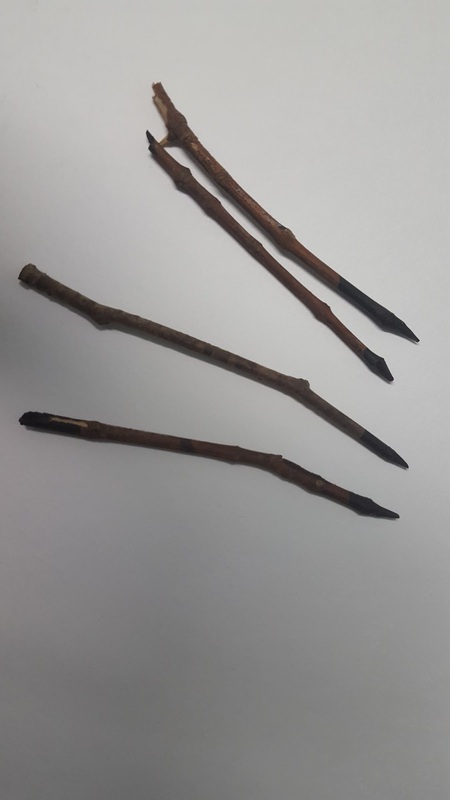 When I was in high school, one of the first assignments our art teacher gave us was to go outside and find a stick shorter than a ruler. 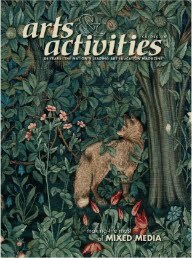 We were intrigued to say the least. 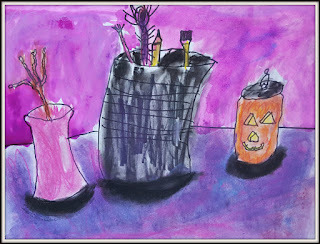 After our sticks were sharpened, we were given India ink and given lots of contour/observational drawing assignments. 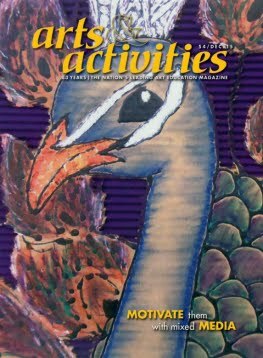 Over the next few weeks we drew everything from nature, to shoes and backpacks to faces from National Geographic magazines, all with just sticks and ink on "typing" paper (this was the 80's). 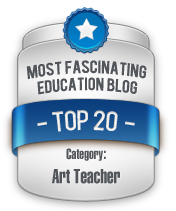 What a great foundation for me as an artist. Not having the ability to erase and having to draw so many things, helped me not worry about making things perfect and just focus on drawing what I saw. 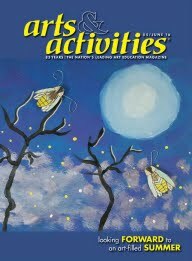 Why I haven't tried this with my students before now is beyond me. 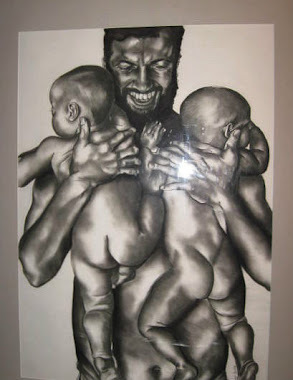 It gives line drawings a wonderful quality as the line thickness varies. 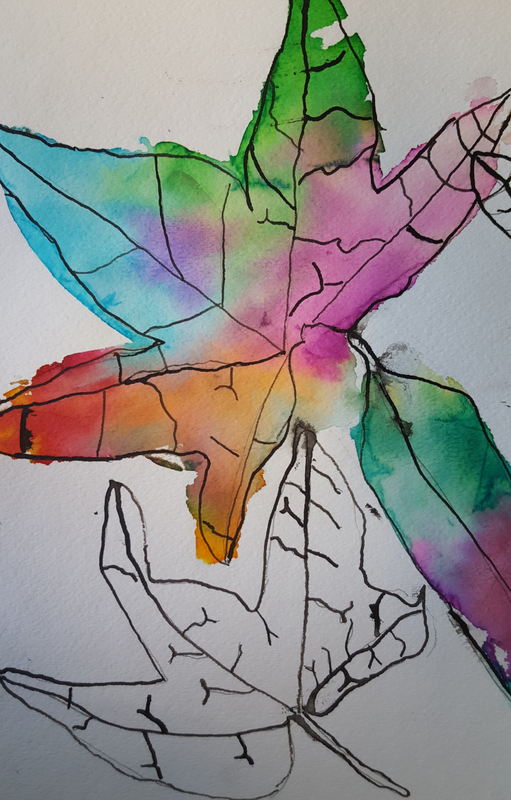 It's perfectly imperfect. 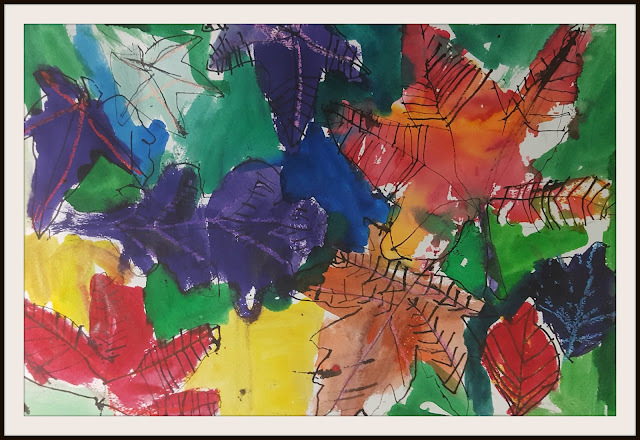 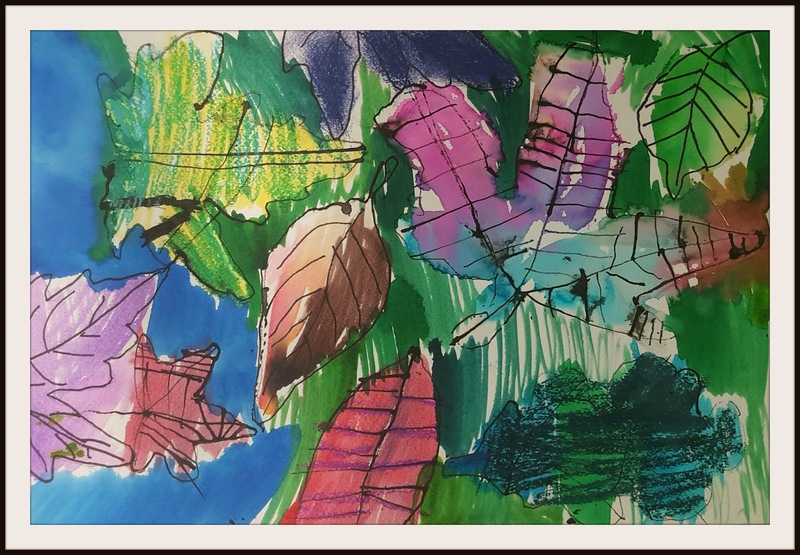 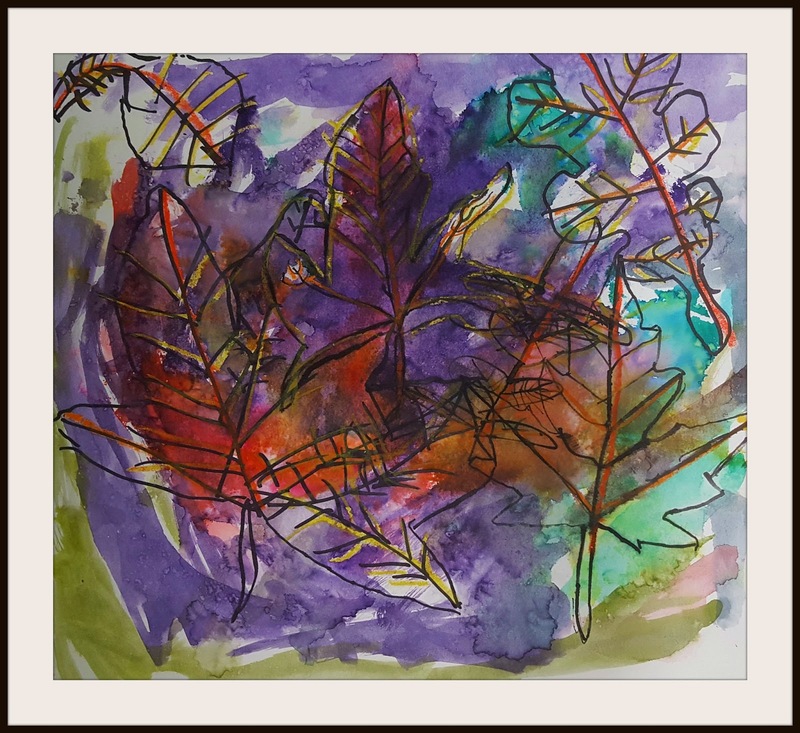 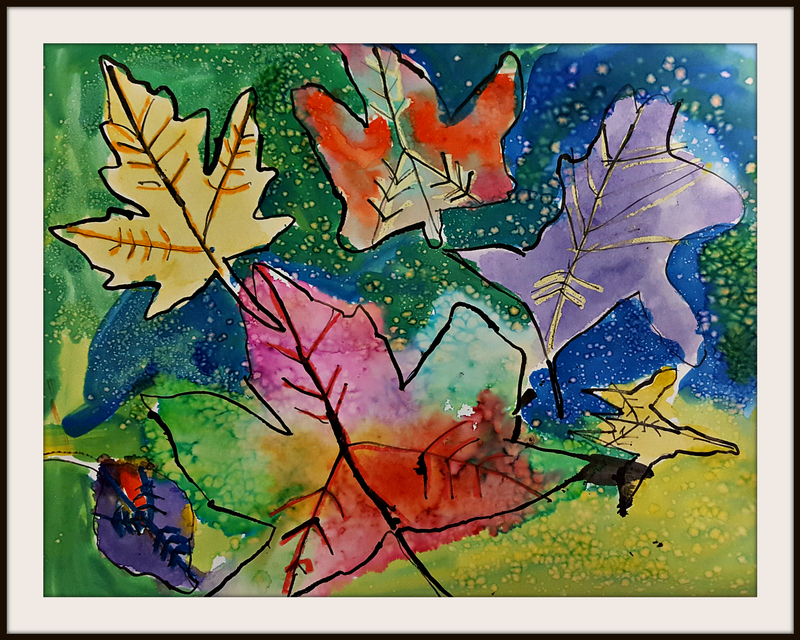 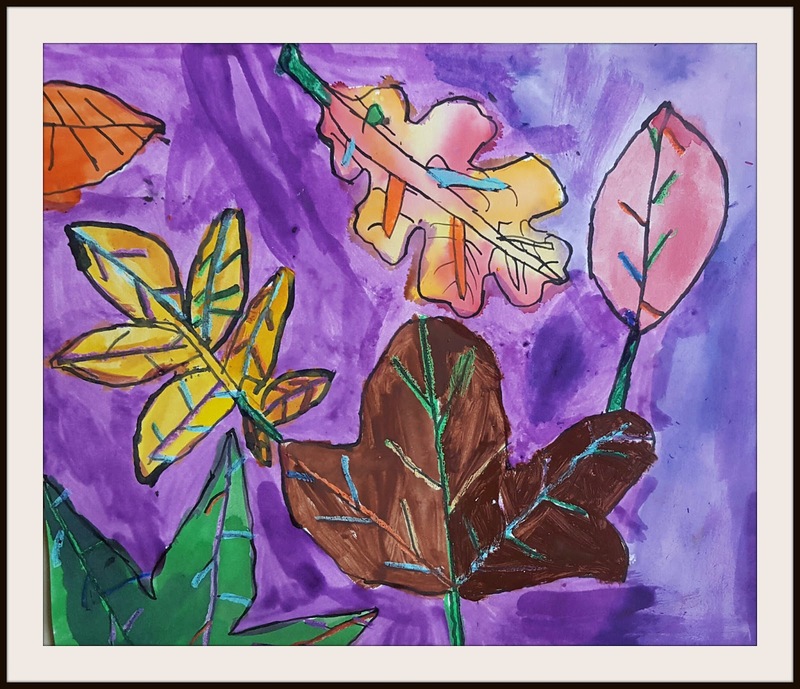 My Observational Art Lab students had a variety of leaves to observe and draw for their mixed media pieces. 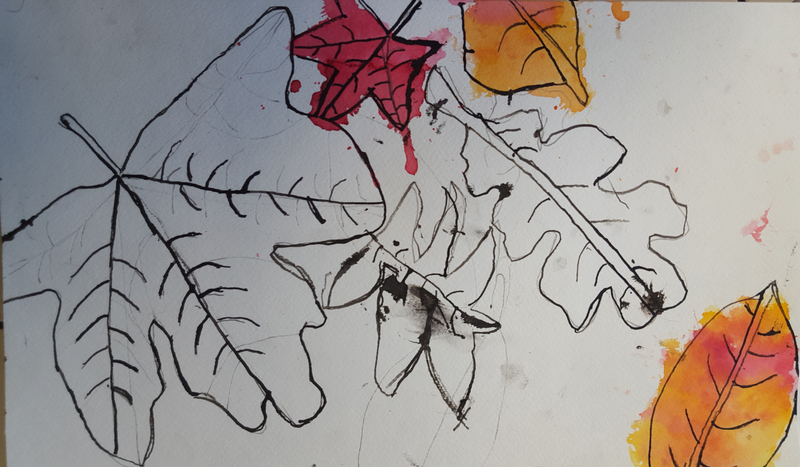 I had my younger ones trace their leaves and then observe and draw the veins. 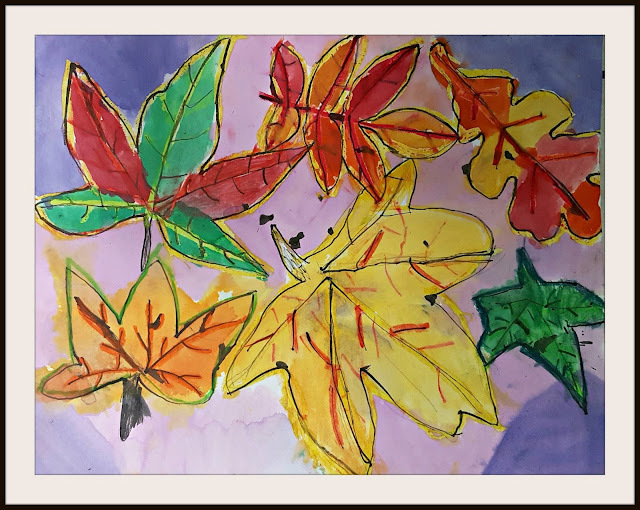 They turned their paper around and drew leaves in every direction, filling their paper. I decided to let them really play with media and offered oil and chalk pastels, bleeding tissue and watercolors, encouraging them to experiment with different combinations. 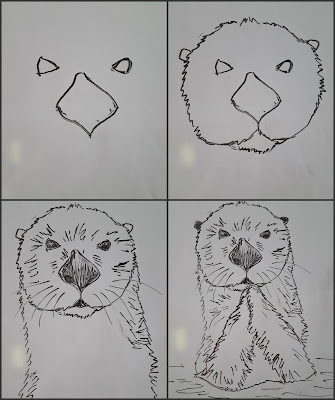 I have had several requests for a drawing tutorial for my Sea Otter post last October. 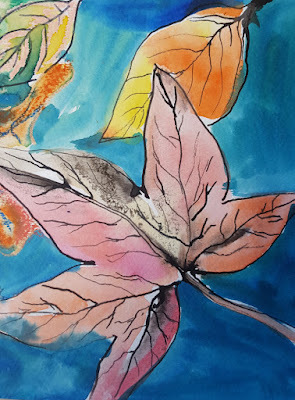 So I added a basic one below and thought I'd post again. Hope this is of some help! 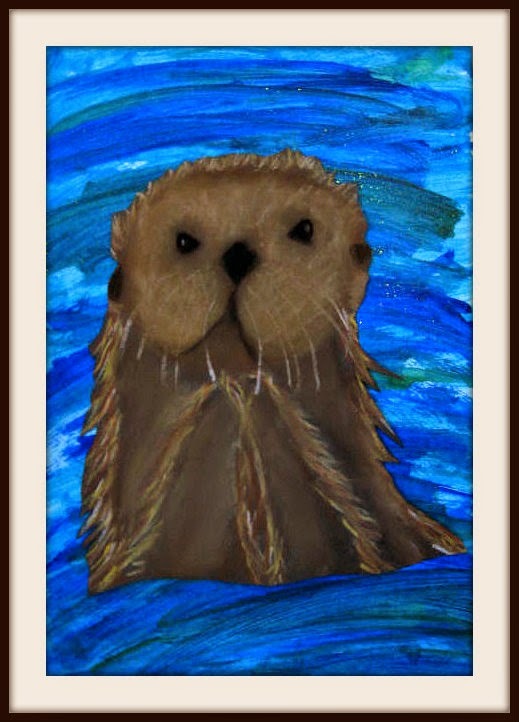 The otter's nose points upward and downward, (like 2 chocolate kisses glued together). 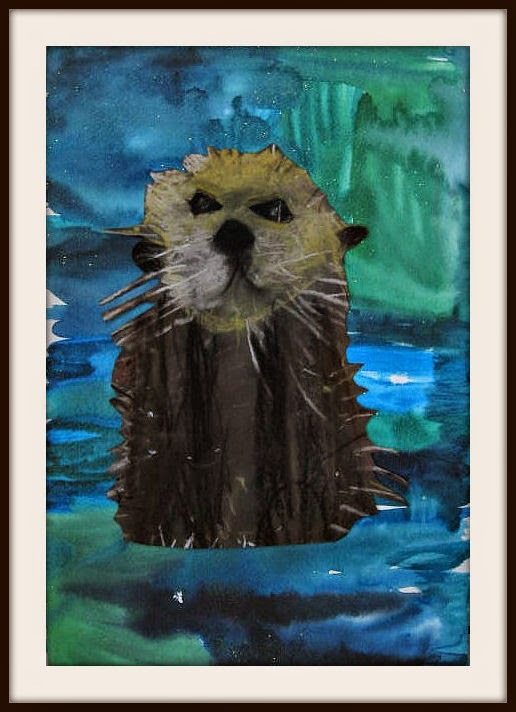 From there I like to draw a furry head around those features, connecting to the tip of the nose on each side. 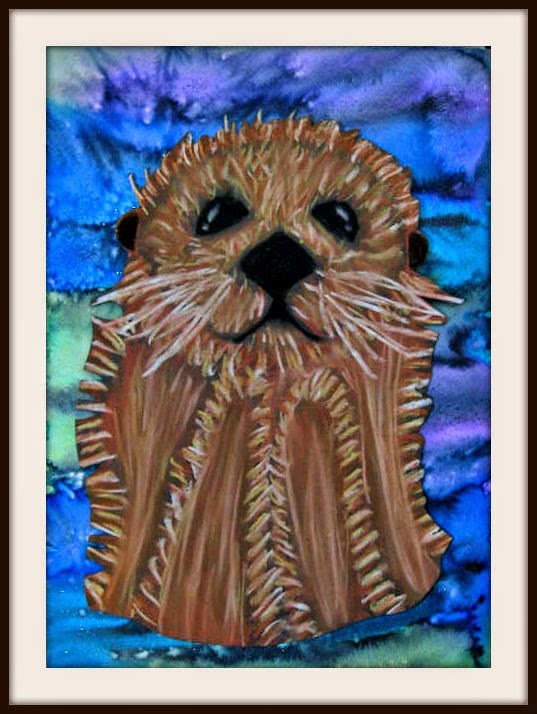 Now add a furry little chin and small ears. 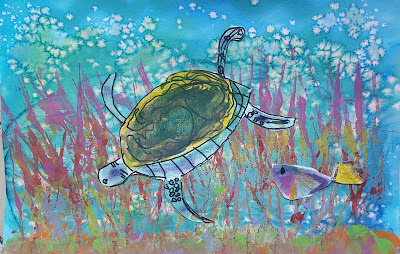 A body can be drawn and stop wherever it enters the water. 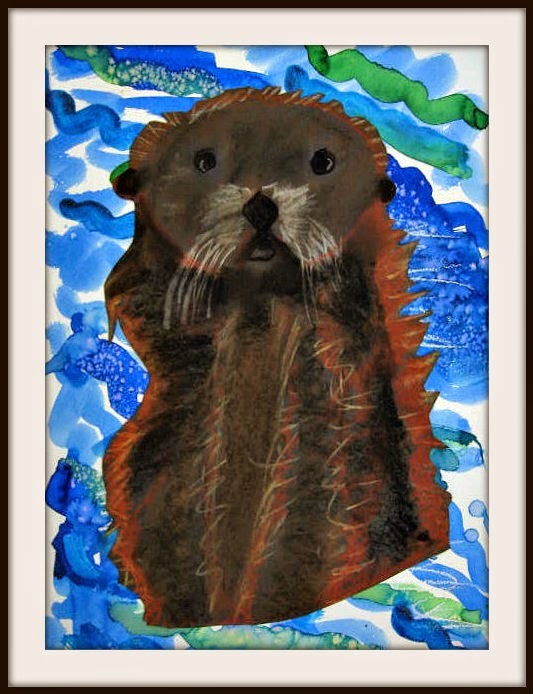 You may choose to add furry "arms" extending toward the mouth. 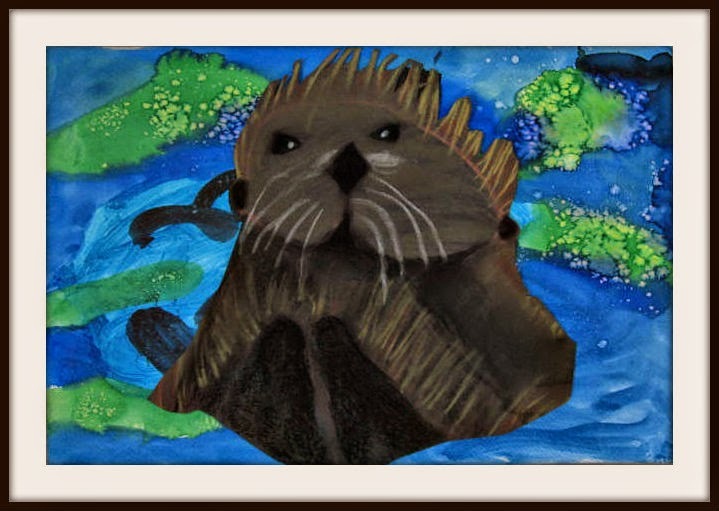 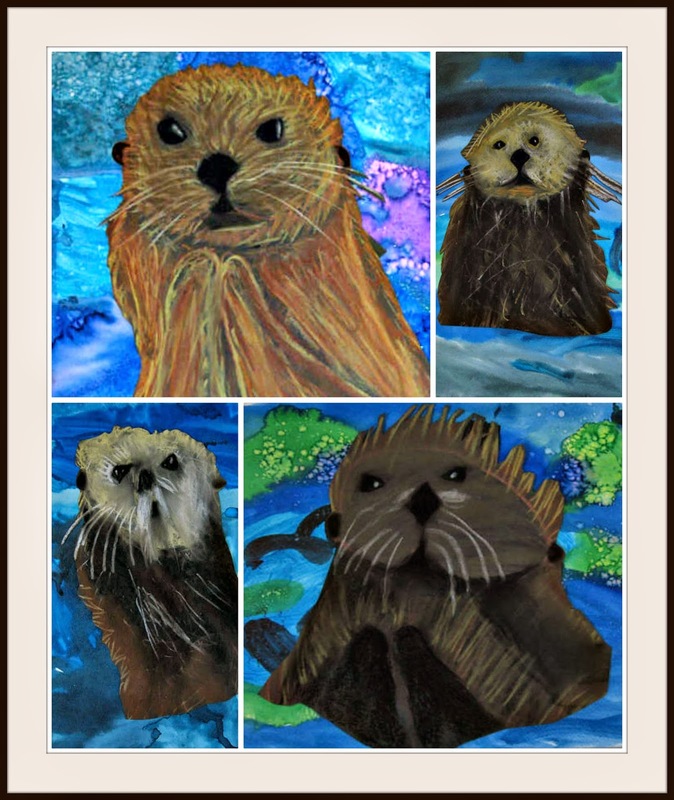 We did this project in chalk pastel and I encouraged the kids to add as much texture as possible with the tip of their chalk to show the otters' thick fur. 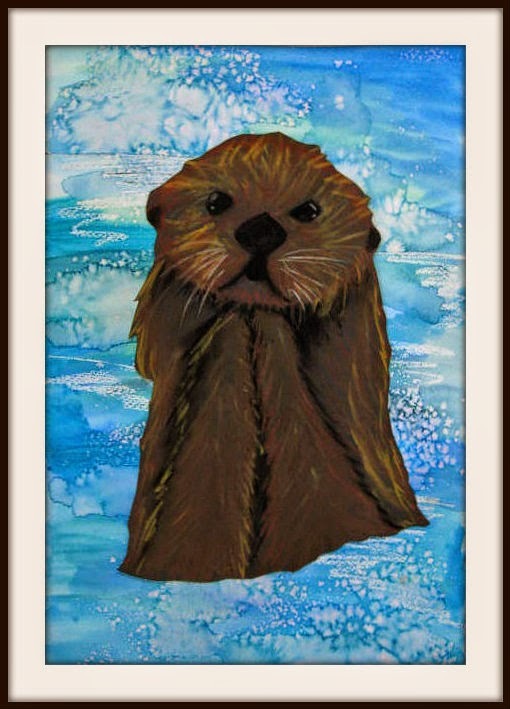 Don't forget to add whiskers and some white highlights in the eyes! 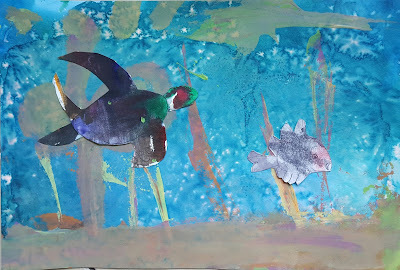 My Animals and Their Habitats art class explored a variety of media in making these collage pieces. We first created a background of wet on wet watercolor sprinkled with salt. 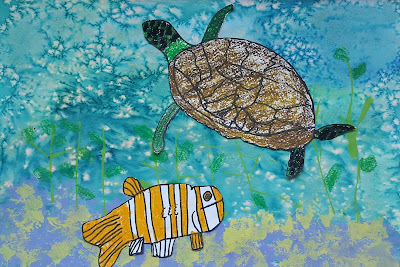 Once dry, I gave the children cotton balls and small strips of cardboard to created printed coral and seaweed. 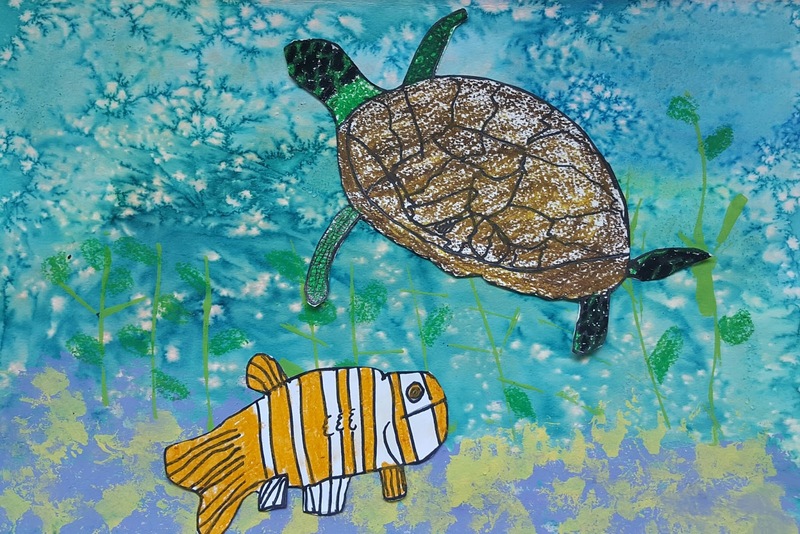 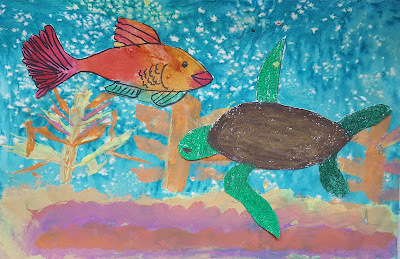 Sea turtles in a choice of media, as well as tropical fish were added to their underwater scene. 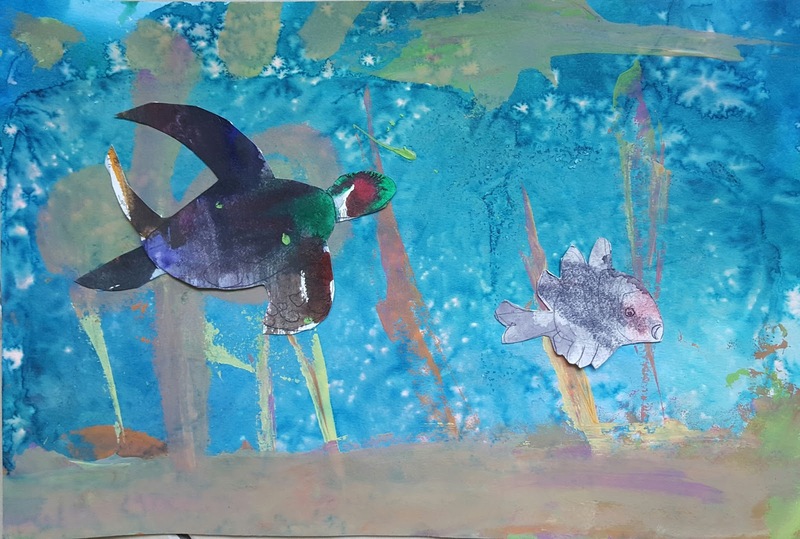 I enjoyed seeing the kids putting their own spin on these collages. 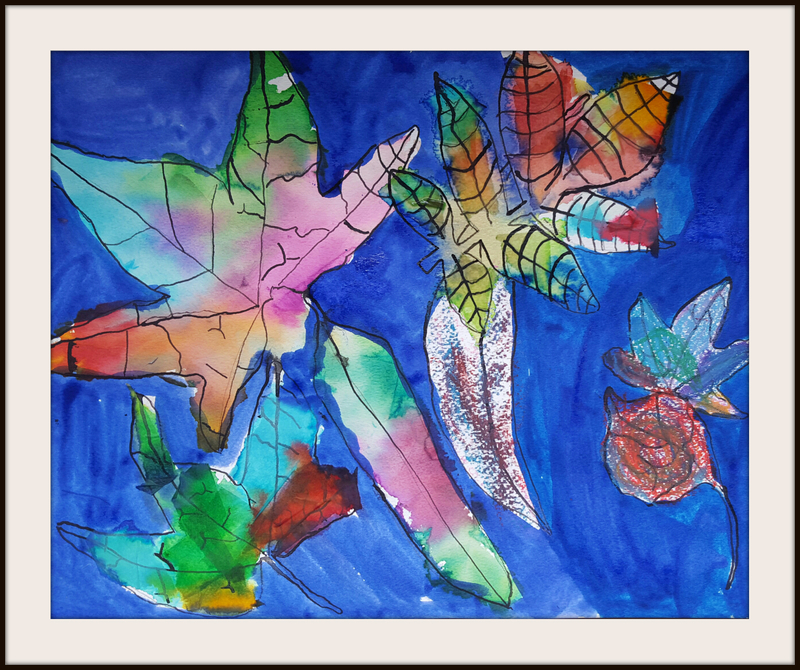 Artwork by kinder through 2nd graders.